Brass tacks: Demos; Style 01, Style 02, Style 03 and the code. Using this new feature of html can be as easy as creating a form and within it creating an input with a required attribute. 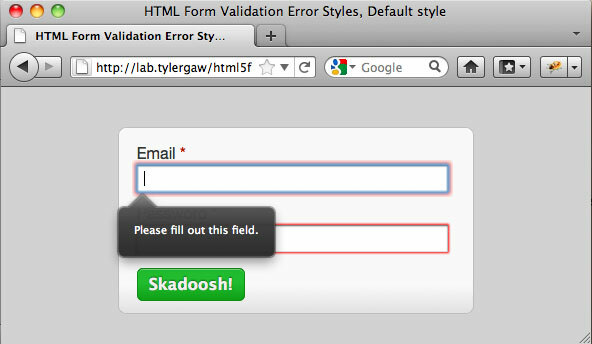 When the form is submitted, browsers that support validation will take the reigns and make sure that the required input has a value. 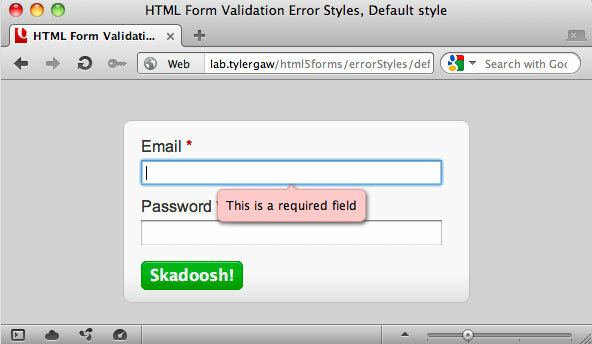 If it does not, the browser will display a validation error message. 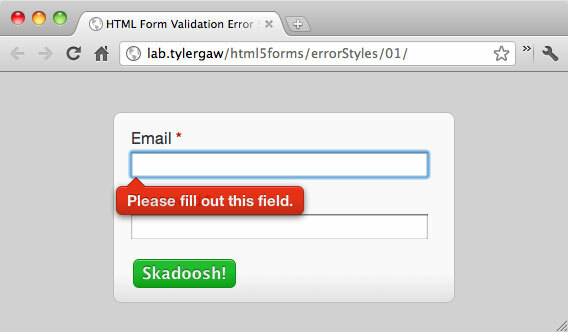 In addition to validating required fields, the form validation will also check to make sure inputted values match given input types. New in the Living Standard are quite a few new input types such as; "email", "url", "number" and so on. Check out the full list located at http://developers.whatwg.org/the-input-element.html#the-input-element. As of this writing, there are three browsers that both support html form validation and display error messages when needed. Browser support includes; Chrome 10+, Firefox 3.6+, and Opera 11+. 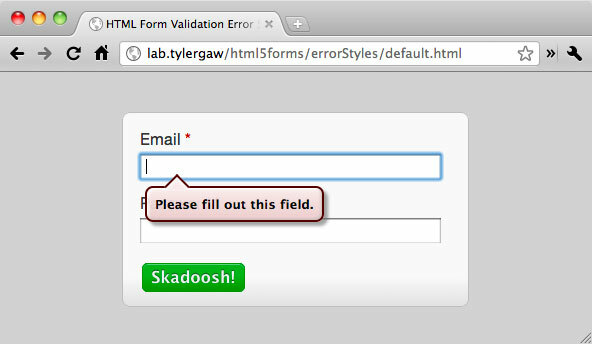 Safari doesn't care about validating your forms and I haven't checked any versions of IE, maybe 9 or 10 support this? 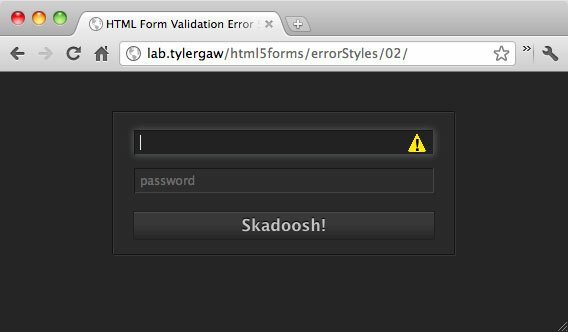 Each browser handles the styling of validation messages differently. Of the three, only Chrome currently offers a way to apply custom styles to the message. Through non-standard, Webkit-specific pseudo classes you are able to style the messages in any way that floats your boat. That's what I'm focusing on with this article. That's a good question. I haven't heard anything about Opera, but it seems that the style and even handling of the error messages is an open discussion with Firefox. I did quite a bit of digging around in Bugzilla and in the FF 6 source code, but couldn't find any solid information on what the plan is. My hope is that a standard will emerge for styling the messages, but that could be far off. There are four more pseudo classes that were added as I was writing this article. These are currently only in the nightly builds of Chrome/Webkit and seem to just allow further control of the styling. As of this writing and Chrome 13.0.782.112 these classes do not seem to have corresponding html elements. Only the bubble-text-block and bubble-heading contain default CSS rules and they are minimal and any CSS rules applied to these do not seem to affect any changes to the current validation error messages. We'll have to wait and see how these elements get put to use. The rest of the markup for each demo is nearly identical, differences include; using <label> elements for the first demo and some different structural elements for each. To really work with the message styles, I wanted each demo to have a distinct style from the others. Demo 1 has a kind of standard-looking style with error messages that are big, bright and bubbly. Demo 2 has a sleeker, higher-tech, control panel-y look with a slimmed down error icon with no text. 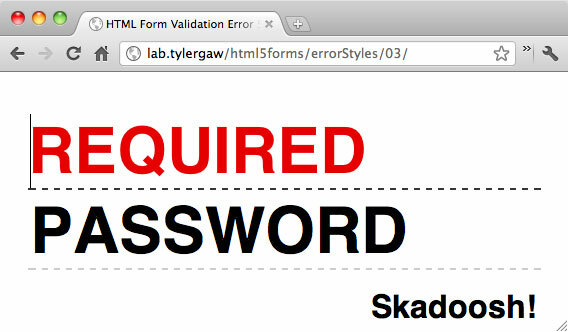 Demo 3 has an artsy, Draplin-inspired, Futura-filled look that carries over into big-ole, text only error messages. Demo 2 uses a similar, but less complex animation to slide the serious looking icon in from the left. This demo also introduces something new; custom error message text. The message text, among many other things, can be customized through the Constraint Validation API. This is a fairly simple block of code, we start by looking at each input element on the page through a for loop, if the input is not a submit button we then use the Constraint API method setCustomValidity to apply the custom message of "!" that we stored in the errMsg variable. In my opinion that should be the end of the work needed, but there is more. For some reason, when we set a custom error message with setCustomValidity that also removes the error checking from the input. If we were to stop here and submit the form, it would submit without triggering any errors. Starting at the line cur.oninput is the code needed to get around this oddity. The oninput event is fired each time a key is pressed that will change the contents of the input, each time the event fires we are checking to make sure the input has a value and that the value is valid according to the input type. The Constraint API makes available a validity property for input elements. This object contains a number of properties to determine the validity of the input, the one that we're using to make sure the value given is Ok is typeMismatch. If the input either has no value or the given value is not of the correct type, we need to set the custom message again. If a correct value has been entered we then set the custom validity to an empty string, which does a kind of reset on the validation. The input will then be validated normally again. This is definitely new, new stuff, and with all fun new things it will take some time before it can be used on a wide scale. I don't think that should be seen as a huge hinderance though. The Constraint API seems mature enough to be put into use right now, with the aide of a poly fill for browsers that don't yet support it. I haven't used it yet, but at least one exists already; http://afarkas.github.com/webshim/demos/demos/webforms.html. The error message bubbles are not really ready though. With only one browser supporting custom styles, and with no small amount of finagling needed to get them looking right, for now we'll need to keep creating our own error messages. I'll take it though, this is a huge step in the right direction and I can't wait for wider browser support and even more fun new things that will no doubt come with it.